From the book Thought Forms, this painting depicts what it would look like to see the music of a Wagner Opera if a performance were occurring inside this manor-home. Is it possible to see music? Or hear a painting? The art exhibition "Enchanted Modernities: Mysticism, Landscape and the American West" answers these questions and more by exploring the impact of Theosophy, an esoteric-philosophical movement, on visual artists, writers, and composers in the American West. Alexander Scriabin, a Russian pianist and composer who was deeply influenced by Theosophy, visualized a grand magnum opus, or large and important work, which he entitled “Mysterium.” This week-long, multimedia performance would have taken place in the Himalayas incorporating music, incense, dance, and light. This great and final concert would ultimately bring about the end the world. Luckily for the fate of the rest of us, this work remained unfinished. In the Nora Eccles Harrison Museum of Art's exhibition "Enchanted Modernities," the three curators, Christopher Scheer, Sara Victoria Turner, and James Mansell, created an exhibition centered on Theosophy with the goal to tantalize the senses without ending the world as we know it. They join me today to “demystify” the enigma surrounding Theosophy and give us a personalized tour. The imposing figure of Madame Helena Blavatsky, the founder of modern Theosophy. As we ascend the steps leading to the exhibit, we are first confronted by a large, looming black and white photograph of the Founder of Modern Theosophy, Madame Helena Blavatsky. “The picture that greets you is one of her in her characteristic pose looking directly into the camera, unflinching,” said Christopher Scheer, assistant professor of musicology at Utah State University. “This is often a pose which is taken up by many Theosophists in photographs because they felt that this could show their power. You could see into their eyes and see into their soul. 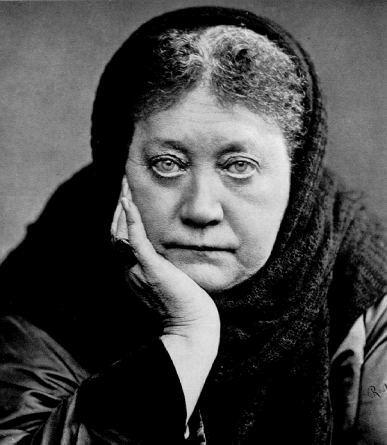 You have to begin with Blavatsky to understand Theosophy in the 19th and 20th century. Everything kind of flows from there. So the exhibition begins with Blavatsky as well,” Scheer said. He says she was quite a magnetic figure and wrote several important books which were foundational texts for the movement. As we walked into the next room, it surprised me to see photographs of familiar landscapes in southern Utah. Little did I know that Theosophy, an idea foreign to so many, actually had ties so close to home. “So in this first room we’re setting up the idea of Theosophy," said Sara Victoria Turner, the assistant director for research at the Paul Mellon Center for Studies in British Art in London. "We're trying to give people a good concept of what Theosophy and the Theosophical society is because we know it will be quite unfamiliar to many people. “And then at the end of the room, we have this incredible, large, photographic work, showing the "Home of Truth." Also, we have three other supporting photographs which really give a sense of the community out there in Utah,” Turner said. So the big question is, well, what is Theosophy? James Mansell, a lecturer in cultural studies at the University of Nottingham, says there isn’t a straightforward answer. "Theosophy is somewhat difficult to define in a kind of singular sense, which is why we’ve put set several quotes on the wall from very different people who were involved in the movement, giving their definition of what Theosophy is," Mansell said. "But I think one of the best ways to describe what Theosophy is is to think of it as a kind of fusion of religion and science, as a desire to prove or to explore some of the mystical forces that made religion work and make the spiritual world work. “Many of the images in this show are about exploring and visualizing a kind of hidden world of mystical forces. That was really why I think many of the artists involved in this exhibition were so drawn to Theosophy. It gave artists a real place to delve into that mystical and spiritual world, which was invisible to the naked eye, as it were,” he said. Turner said that they made it a point to focus the exhibition on artwork which was already in the museum's collection. From there they were able to draw from an incredible group of works from artists influenced by Theosophy. “We’re looking at some works by the artist Agnes Pelton who lived in Cathedral City, near Palm Springs," Turner said. "The museum is very lucky to have some absolutely brilliant works by her. We’ve supported this by loans that we have made. I’m looking at a painting called "Nurture" which is in the collection, which has a really shimmering quality. She was very interested in putting contrasting colors next to one another so they seem to vibrate off the canvas. Here we have a huge cloud, a bulbous cloud, floating in the sky with lots of oranges and purples and yellows and blues and it really shimmers and vibrates. “She asked her viewers ‘just be still, be quiet. 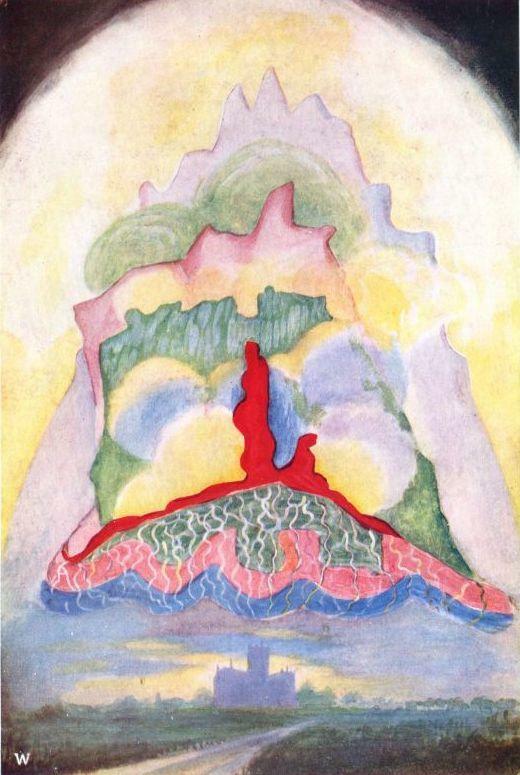 Look at this work for a while and let it speak to you.’ So she saw painting as akin to meditation, and she wanted her viewers to be in a meditative state when they were looking at her works so they could use the material forms of the oil on canvas so they could access another world - the world of the unseen. I think that is what she is really doing here, using her experience of painting in the desert landscape. She often went out at twilight and also when the sun was rising so she could capture those light effects,” she said. In a glass case near the center of this room there is a book entitled "Thought Forms" which was co-written by two influential Theosophical thinkers. It is open to a page which displays a color chart. Each color on the chart is labeled with a different emotion, for example, black signifies "malice," or yellow signifies "highest intellect." Suddenly, the meaning of all the paintings in the room seemed to change. This brought us to the end of our tour where, in the last room, Mansell pointed out a small, seemingly insignificant work. “We’re in the final section of the exhibition here and one of the main artists who’s dealt with in this section is someone called Oskar Fischinger," Mansell said. "He was a filmmaker as well as a painter. The work I’m looking at right now is actually a sketch or study from the Disney film "Fantasia" which he worked on briefly before falling out with the producers. This is one of those cases where you can very clearly see a connection between Theosophical art and Mystical art and a kind of mainstream American culture." There is much more to see and do in this exhibit which runs until Dec. 10. 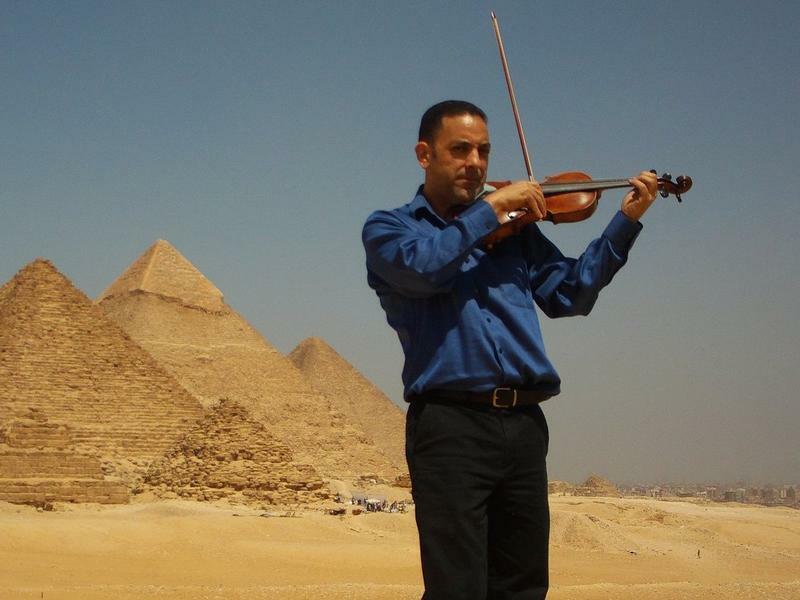 For the inaugural event in a new series called “Museum + Music,” pianist Ron Squibbs will perform works by Theosophical artist and composer Dane Rudhyar on Sunday, Sept. 21. Dr. Christopher Scheer will also be giving a Gallery Talk on Wednesday, September 24 at 12 p.m.
A painting that had earlier been thought to be a fake and had been stored for decades in the attic of a Norwegian home has now been identified as a long-lost work by Vincent Van Gogh. 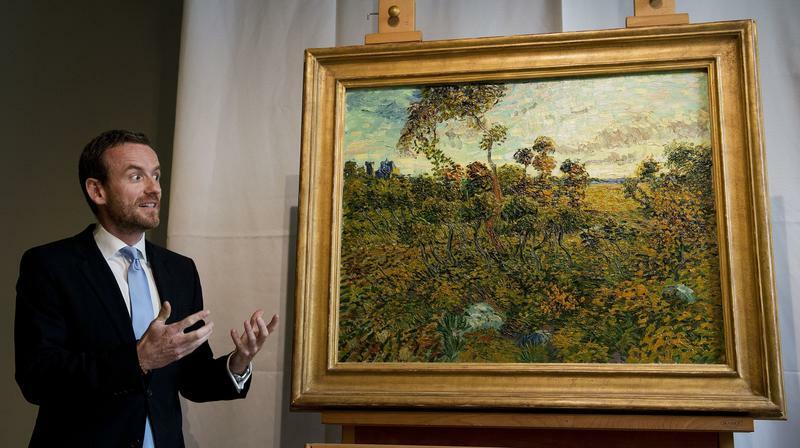 Sunset at Montmajour has been authenticated thanks to "extensive research into [its] style, technique, paint, canvas, the depiction, Van Gogh's letters and the provenance," Van Gogh Museum Director Axel Ruger says in a statement posted Monday by the Amsterdam museum.